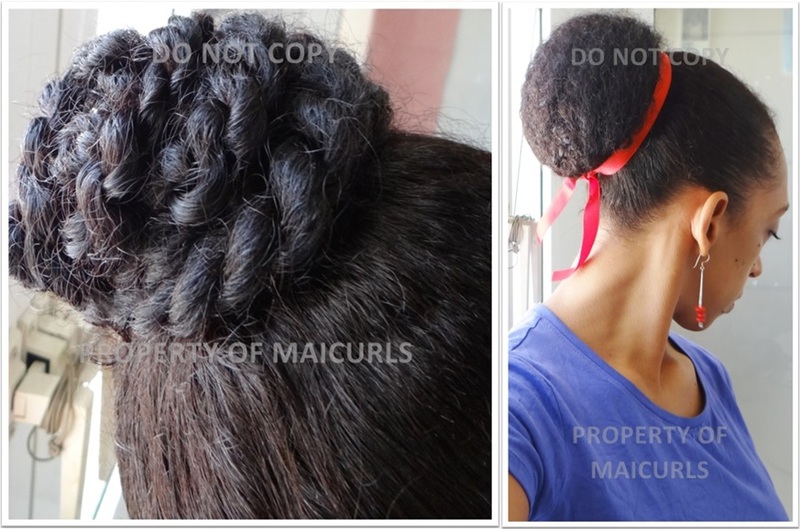 It has been a week since I started the Protective Style and Castor Oil Challenge setup in Napturally Curly.com’s forum. How did my first week go? It went really well! I enjoyed the fact that I didn’t have to do too much with my hair in the morning. I literally just fixed the top of my hair (I slept with a satin scarf which sort of helped keep down fly-aways). “Fixing” didn’t take long and I was out the door. My roots felt super soft and I only moisturized my hair 2 times the whole week. I washed my hair the day before the challenge started (which was the 21st September), moisturized, sealed and then let it air dry in twists. Day 1 – First hairstly: After taking down the twists I massaged a little of my mixed Castor/Rose Infused Grapeseed Oil with Peppermint on my scalp, hairline and a tiny bit to my ends. This is the style I did for the first 3 days. I put my hair in a ponytail, made about 8 twists, wrapped them around to make a bun and held it in place with bobby pins. Day 3 – I reapplied some castor oil mix to my scalp and hairline. 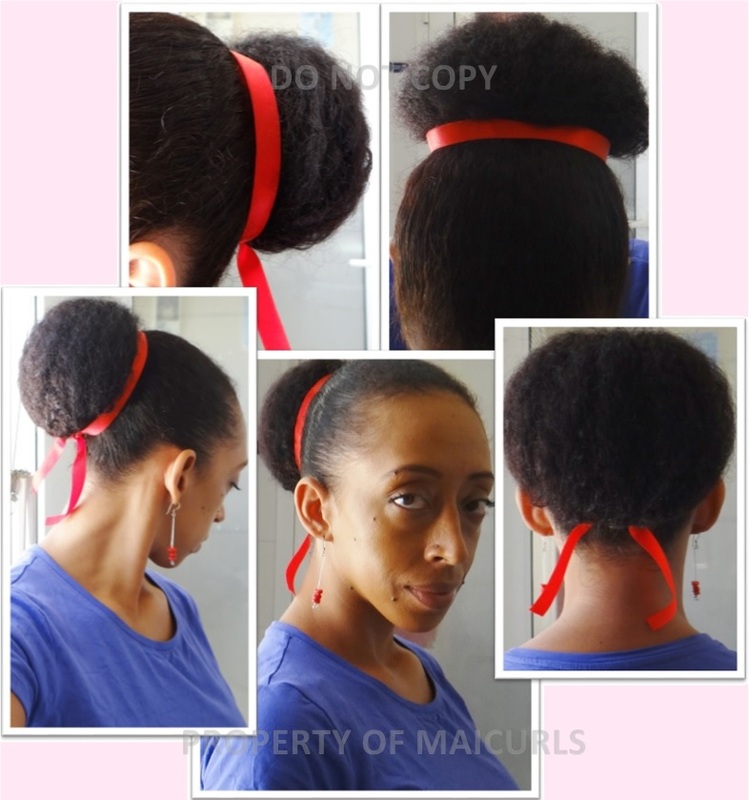 I put my hair in a ponytail and rolled my ends up and under – towards my head. Using bobby pins I kept my ends tucked underneath and used a ribbon for a little added color. I put my hair in twists to air dry, pinned them down for the night and will be styling my hair for the next 3 days! Looking forward to the new week ahead! This entry was posted in Accessorizing a protective style, Buns, Castor Oil, Castor Oil Challenge, Napturally Curly, Natural Hair Forums, Protective Style, Protective Style Challenge, Random Up-Do's and tagged castor oil, Castor Oil Challenge, castor oil for natural hair, DIY Rose Infused Grapeseed Oil, DIY Rose Infused Oil for Hair, Napturally Curly, Napturally Curly Forum, protecting natural hair, Protecting your ends, Protective Style, Protective Style Challenge, protective styles for natural hair, puff bun, Rose infused grapeseed oil, Two strand twist bun on September 29, 2014 by Maicurls. Cute style, I love the twisted bun! Also nice to know that your castor oil challenge is going well. Can’t wait to keep up to date with your results! The challenge is going great…I really can’t wait till November to do an overall “check”. I just checked your blog and subbed. BTW that frohawk is something fierce!!! Looks really good on you! 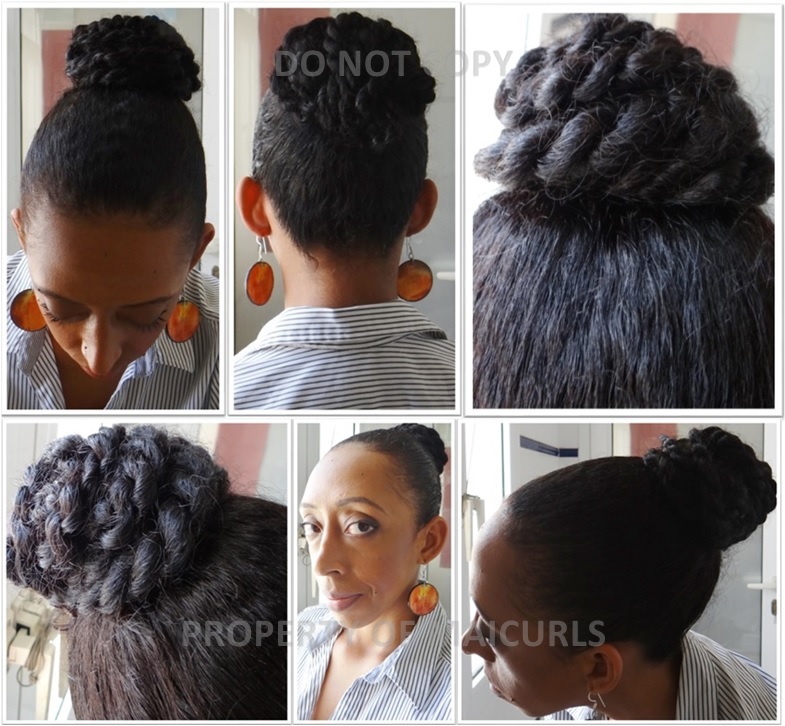 Thank you for sharing your experience with the challenge thus far, I really like your bun styles, they are so elegant!